It’s always a pleasure to welcome a client back to Dawnvale. This was our second turnkey fit out for the Bert’s brand, owned and managed by the Mewbury family. This time, we were working on a new branch, up in Hull. The brief was clear: a relaxed and family-friendly restaurant with a simple menu, focusing on pizzas and gelato. We were brought in to bring the proposed design to life, managing the build and installation from start to finish. We took the project at Bert’s from bare walls to stunning completion. The restaurant features a number of distinct areas, including commercial kitchen, bespoke bar, gelato counter and a variety of seating zones. The ergonomic open-pass commercial kitchen is designed with maximum productivity in mind. We consider the menu when designing a kitchen, envisioning the needs and movements of the chefs in every area. The commercial kitchen is fitted with the latest technology, including a KERS heat recovery system, which uses waste energy from the ovens to heat water. Good for the environment, and the bottom line. Authenticity is an important part of the Bert’s brand. We imported a specialist wood-burning pizza oven direct from Italy, installing it in prominent view so customers can enjoy the whole experience. We manufactured and installed a bespoke ceiling raft from reclaimed scaffold planks and mild steel brackets. The full items was constructed and stained on site, covering 90% of the restaurant on completion. We imported a specialist gelato unit and fitted it beautifully into the front bar, giving customers the pleasure of seeing the desserts on offer and allowing staff to serve directly over the counter. 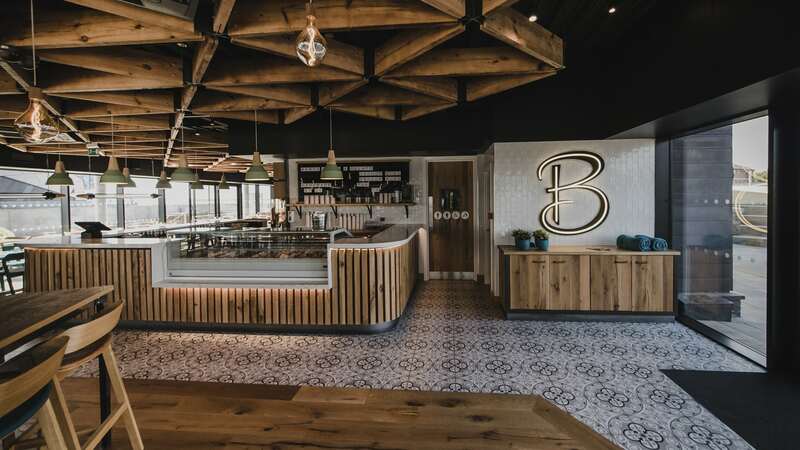 We used a mix of muted colours and visually impactful textures to achieve a new industrial feel to Bert’s in Hull. Reclaimed timber, metal shelving and exposed brickwork combine for eclectic results. A blend of Italian leather covered booth seating and wooden dining tables and chairs add warmth and comfort to the restaurant, while pops of stylish teal bring the whole scheme together.